I still enjoy a beach day, but now with proper prep and protection. Prep being a good sunless “base” tan and protection being an umbrella and plenty of SPF. Coola is a hands down favorite brand for me (you’ll see quite a pattern here), I’ve been using this one on my face and have loved the results. It’s a serum so it’s really light weight, clear and smells great. You can also mix it with your moisturizer for a lighter more gradual tan if you’re worried about looking too dark. Another Coola product I love is this sunless tanner firming lotion. It’s 70% organic which is nice for peace of mind. Plus it smells great and looks natural! 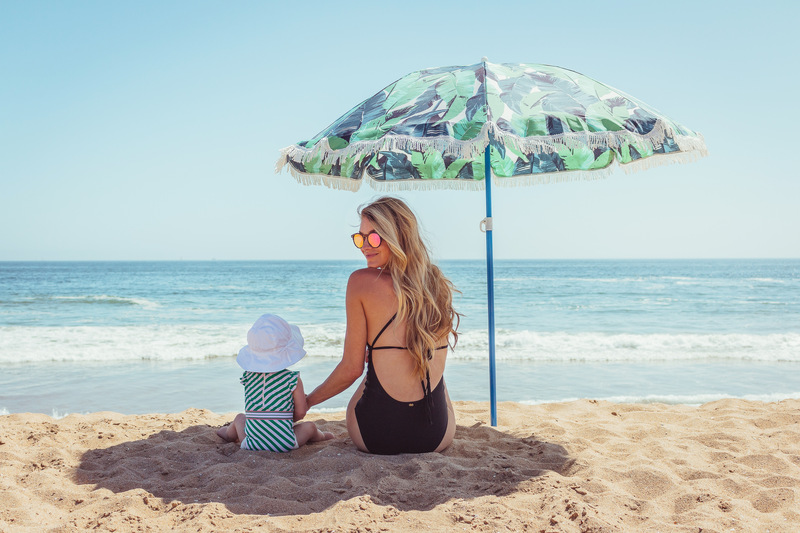 I got this Bondi Sands tanning foam in a PR package and took it for a test drive before we shot these beach photos. It comes with a mitt which makes it even easier to apply, plus it comes out with a slightly green tint. Don’t worry, you rinse off after leaving it on for 1-3 hours and the tint completely goes away. It’s super natural looking – comparable to an airbrush tan. Another bonus is it will leave your bathroom smelling like coconuts. This Sally Hansen airbrush legs is my go-to when I need a quick tan ASAP. I’m talking an hour before an event and I realized I forgot to tan my legs. Spray this on, blend with mitt and you’re left with perfectly tanned and slightly airbrushed legs. I like the medium glow shade best. *Hack: The first time I used this I couldn’t find a mitt but I had a few breast pads leftover from breastfeeding. Worked like a charm! Let’s start with baby. This is my favorite sunscreen for Crosby. It’s organic, mineral-based and 100% natural. It doesn’t really have a scent and it has a white layer of film that provides and extra shield on baby’s skin and makes it easy to see if you missed a spot. Again Coola is a fan favorite around here. This spray smells so good I’d wear it as a perfume daily! I’m serious. I also just tried these sun silk drops – they’re great to put on under makeup or directly on your skin for day-to-day use. This BB cream is a spring/summer staple in my makeup bag and it’s light enough to wear as a face protectant to the beach while still having a bit of coverage. Other Coola favorites are this stick and this lotion. 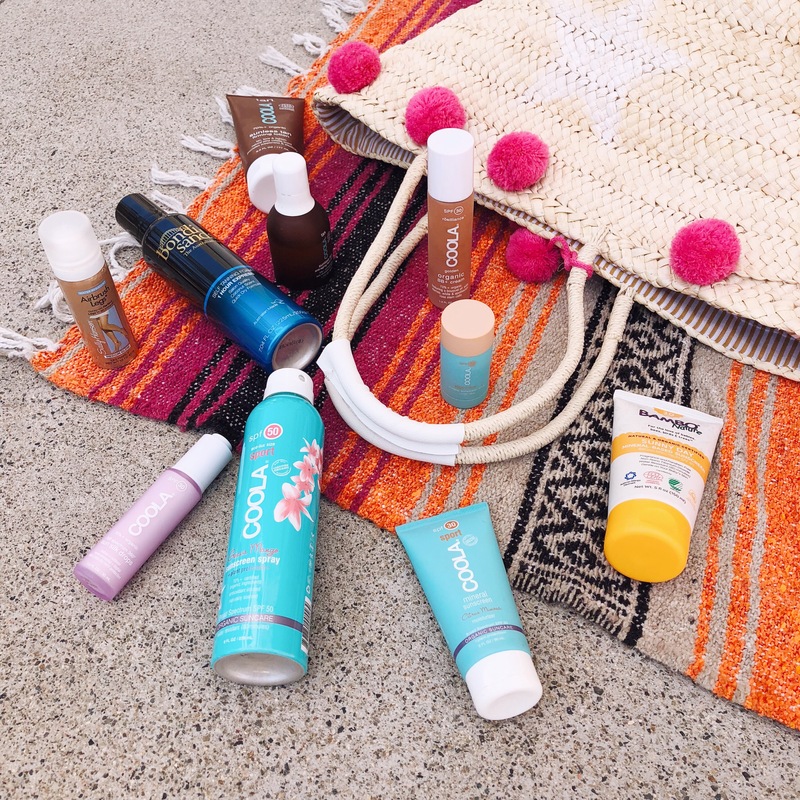 All beach bag staples!